Our custom banners are made of durable vinyl and can be used for many purposes, both indoor and outdoor! Design your own banner for your next event. Add wind slits for outdoor use. 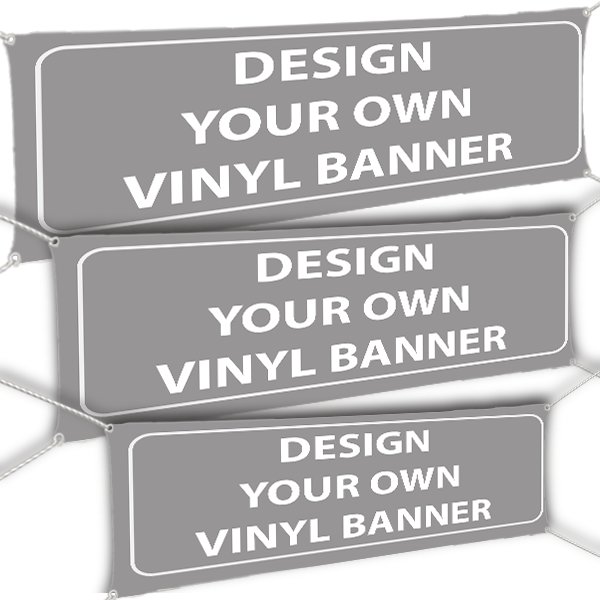 Our custom store and business banners will attract just the right customer to your business. We offer several sizes in custom vinyl banners and provide pre-designed business templates to help make the design process easier for you! All you have to to do is select the banner template that fits your needs. We have pre-designed sale, coming soon, new hours, and grand opening banners, and you can also find unique business banners for farmer's markets, grocery stores, yoga studios, and churches. Once you have selected your banner template, just fill in your custom information including business name, contact information such as phone number and web address, and your event information. Whether you're having a grand re-opening or a huge clearance sale, these quality vinyl banners can promote any message you need whether its indoor or outdoor. Our most popular banner sizes are 3' x 6' and 2' x 4'. If you need a larger size, choose the design your own option in the size of your choice. Other special features of our banners include grommets for easy hanging, optional wind slits, and protective coating. We print your custom banner right here in our facilities using our state-of-the-art large format printer - and your order ships next business day! If you need help designing or ordering a custom business banner, contact us now! Our Customer Focus Team will be glad to help.